Plug Power inks deal with grocery distributor in a market that's drawn a lot of interest from fuel-cell developers. Putting hydrogen-powered cars on American highways may be a pipe dream, but it may work for forklifts on the warehouse floor. Plug Power (NSDQ: PLUG) announced this week it had sold 220 of its fuel cell units to Franklin Park, Ill.-based Central Grocers, Inc. which plans to use them to power the Yale Equipment Services forklifts it's buying for a new distribution center in Joliet, Ill. Using fuel cells powered by hydrogen delivered from an Air Products (NYSE:APD) fueling system will save Central Grocers the cost of batteries and the system to recharge them, Plug Power said in a news release. Using fuel cells also cuts down refueling time to about two minutes once or twice a day, versus batteries that need four to six recharges a day and can take hours to complete, Air Products said. Fuel cell companies like Hydrogenics Corp. and Oorja Protonics are also targeting the forklift market. Fremont, Calif.-based Oorja's fuel cells for forklifts have a twist – they use methanol, rather than pure hydrogen, as a fuel, a choice that the company says eases the cost and complications of refueling (see Greentech Innovations: Why Fuel Cells Finally Make Sense). Plug Power – a 1997 spinoff of DTE Energy, the parent company of Michigan utility Detroit Edison – bought Cellex Power Products Inc. for $45 million last year. 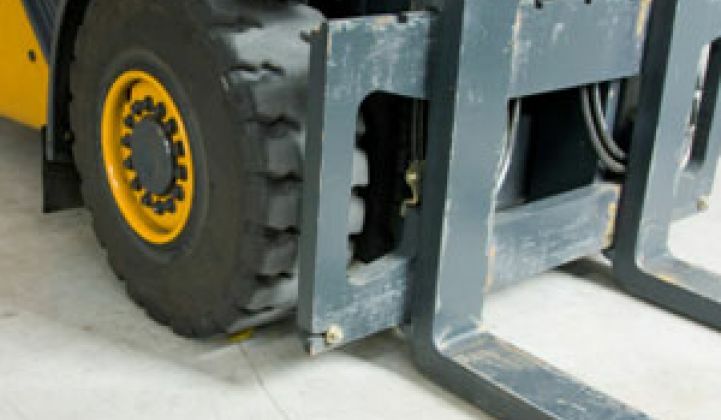 Cellex had tested its systems in forklifts working at two Wal-Mart distribution centers. Given that they operate in enclosed warehouses where charging and refueling stations are close by, forklift makers have been early adopters of emission-free propulsion, mainly lead-acid batteries. But an Argonne National Laboratory study concluded that using fuel cells in forklifts leads to lower greenhouse gas emissions than using batteries, when the entire production chain is taken into account. Still, hydrogen critics note that the gas is both expensive and dirty to make. Commercial hydrogen producers now make the gas by cracking methane at high temperatures. For every kilogram of hydrogen, you get over nine kilograms of carbon dioxide. Hydrogen can also be made from the waste heat at nuclear plants, but they really aren't rigged up for that at the moment. Trying to use fuel cells in cars and trucks has additional drawbacks, including the difficulty of building a distribution and refueling network for hydrogen, which is explosive and needs to be highly compressed (see Ballard's Babies). Plug Power and other fuel cell makers – including Ballard Power Systems (NSDQ: BDLP) –are also looking to utilities and telecommunications companies that need back-up power systems (see Ballard to Deal 10,000 Fuel Cells to India). Plug Power announced last month that it was testing a new combined heat-and-power fuel-cell system with utility National Grid. Business hasn't been all smooth for Plug Power. The company laid off 80 workers, 22 percent of its workforce, in June, and its stock price has fallen from more than $4 a share late last year to less than $1.50 a share in the past month or so. Thomas Weisel Partners analysts said in a research note Thursday that Plug Power's forklift deal was likely worth $3.5 million to $4 million. Plug Power's sales of its GenDrive fuel cell units for mobile purposes like forklifts appeared to be doing better than its sales of GenCore units for stationary power backup, the analysts added. This week's forklift deal has helped Plug Power exceed its goals for GenDrive sale in the second half of 2007, but the company didn't appear to be set to meet its goal of selling 50 of its GenCore units, the note stated.